[SOLVED] How much time does it take for a switch to go from on to off? The equation for the voltage across an inductor is v = L di/dt. 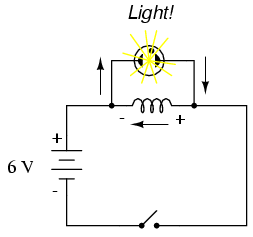 When a switch changes the circuit from closed to open, it changes the current very quickly. My question is how would one know exactly how much time this takes, since you need an accurate answer to calculate the voltage that will be induced. When a switch changes the circuit from closed to open, it chages the current very quickly. Not exactly. When the switch is opened, the voltage across the switch increases. This voltage decreases the inductor current, according to di/dt = V/L. Depending on the switch, and how it reacts to increasing voltage across it, to some extent the energy stored in the inductor determines how the switch opens. Any real switch will have stray capacitance across the contacts. In some switches (car ignition breaker points) the capacitance will be augmented by a physical capacitor placed across the contacts. FETs and transistors will have inter-electrode capacitances in the 10s to 1000s of pFs, depending on device size. The inductor current that continues to flow charges this capacitance. The opening switch is therefore subject to a rapidly rising, though not instantaneous, voltage. If the energy originally in the inductor can be stored in the switch capacitance at a voltage low enough that the switch doesn't break over, then the switch won't break over. This is what the big capacitor does in the car ignition breaker system. The gap between the contacts opens fast enough and the voltage rises slowly enough that the contacts keep 'ahead' of the rising voltage. If the switch voltage rises above some breakdown voltage, then it will break down. With physical switches, this results in an arc between the terminals. This arc can melt and move metal around, so it's often quite destructive to mechanical contacts. It can be mitigated by using high melting point materials, very heavy contacts, or using (as in high voltage switchgear) air-blasts to cool and lengthen, and so extinguish the arc. While the switch is arcing, you could consider it 'closed', or at least not 'open', so the length of time the inductor energy keeps it arcing effectively controls how fast it opens. MOSFETs often have a controlled non-destructive avalanche behaviour, which is specified to be able to repetitively absorb a certain amount of energy. It's quite normal to design a switching circuit such that the stored energy in the circuit inductance is dissipated in the switching FET. When a semiconductor switch can't handle the stored inductive energy, it's common to use a 'snubber' circuit across them, consisting of a resistor and capacitor in series. This makes the switch less efficient in the system, so they are made just large enough to protect the switch, and no larger. You could add that the arc adds a significant resistance to the circuit, thus "helping" to reduce the current. @ElliotAlderson - Although in general mechanical switches open cleanly. Contact bounce is, by its nature, almost always associated with switch closure, when the contacts, you know, bounce. @Neil_UK that is all very good and insightful but if there is no such arc or anything like that, the switch just opens cleanly, how much time does that take? I realize perhaps that is a naive question to ask since all switches are different, but a general guess of how fast would be nice, for example 0.001 seconds or 0.0001 seconds. If it were truly instantaneous the voltage would be infinite no? No. Read what he said about capacitance. The energy stored in the inductance will charge the capacitance to some large, but finite value. Finding Current in Parallel RLC Circuit with 2 voltage sources? [SOLVED] How much Voltage and Energy ends up in this Capacitor? [SOLVED] How much Energy is Stored in this Capacitor?